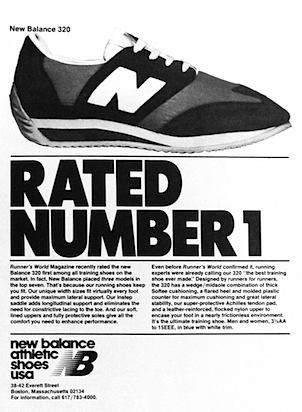 Runner’s World Magazine recently rated the new Balance 320 first among all training shoes on the market. 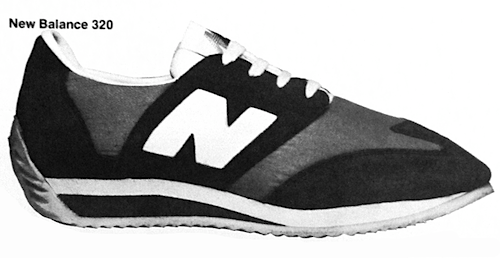 In fact, New Balance placed three models in the top seven. That’s because our running shoes keep you fit. Our unique width sized fit virtually every foot and provide maximum lateral support. Our instep saddle adds longitudinal support and eliminates the need for constrictive lacing to the toe. And our soft, lined uppers and fully protective soles give all the comfort you need to enhance performance. Even before Runner’s World confirmed it, running experts were already calling our 320 “the best training shoe ever made.” Designed by runners for runners, the 320 has a wedge/midsole combination of thick Softee cushioning, a flared heel and molded plastic counter for maximum cushioning and great lateral stability, our super-protective Achilles tendon pad, and a leather-reinforced, flocked nylon upper to encase your foot in a nearly frictionless environment. It’s the ultimate training shoe. Men and women, 3 1/2AA to 15EEE, in blue with white trim.